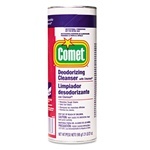 Comet is perhaps the best known cleanser in the world for getting rid of stains in sinks and tubs. This famous procter and gamble brand is found in most kitchens throughout america. Just wet the comet cleanser and scrub anything off any dish or appliance.